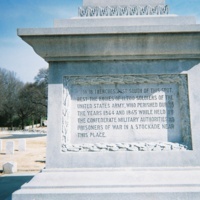 The side panel for the Federal Monument describes the purpose of the memorial to "the memory of the unknown union soldiers who died in the confederate prison at Salisbury, NC." 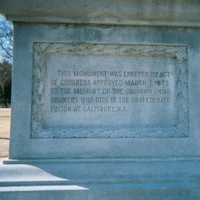 Main panel of the Federal Monument describing the impossible number of Salisbury prison dead. Built in 1909 the Maine Monument was created to honor the Maine soldiers who died in Salisbury prison during the Civil War. Paid for by the Maine state legislature. The United Daughters of the Confederacy created a marker contextualizing Salisbury prison in the 1990s. Countering the Federal Monument, the UDC marker lowered the death toll at the prison from the impossibly high 11,700 to a more plausible 3,700. Created in 1910 the Pennsylvania Monument was built to honor prisoners from the Commonwealth who died at Salisbury prison. The Pennsylvania Monument did not attack the Confederate authorities and focused on peace. From the main gate at Salisbury National Cemetery in Rowan County, North Carolina. This image was taken on March 15, 2014. It shows a stone wall attached to the iron wrought gate which allows entrance to the cemetery.